Agrippa apparently wanted to dedicate the temple to Augustus, but Augustus refused the honor. So Agrippa dedicated it instead to Mars and Venus, the mythological progenitors of the Julio-Claudian family and to associated gods: "Pantheon" therefore meant "all the gods of the Julian and Claudian gentis" rather than "all the gods in general". Agrippa's structure was rectangular and much smaller than the current Pantheon, and faced the opposite way (south rather than north). It essentially occupied the space now covered only by the porch of the present Pantheon: it was only a little wider than the present porch, having an additional set of columns in each end. Like the Temple of Concord in the Forum, its doors were on one of the longer sides. Although there are historical accounts of several fires and reconstructions, there are only two distinct levels below the present porch. The lowest level is Agrippa's, and it is eight feet below the porch pavement we see today. There is an intermediate level five feet below today's porch, but it can't be positively identified with any particular reconstruction phase. There may have been a plaza in front of Agrippa's temple which corresponded in shape and size to the rotunda of the present Pantheon: the foundation of today's structure is incorporates an earlier retaining wall. The Pantheon and its neighborhood were frequently flooded by high water from the Tiber River, and it wasn't until the Tiber dikes were completed in the decades after the 1870 reunification of Italy that this pattern changed. Earlier construction levels, being at a lower level, would be more susceptible to flood damage, but all known destructions were caused by fire. Hadrian built the Pantheon that we see today. The name of no architect survives, and it may be that, as legend insists, Hadrian conceived and designed the building himself, just as he is said to have designed his vast Villa Adriano near Tivoli. Planning began in about 120 AD and construction shortly thereafter. By 126 AD the structures of the Pantheon were essentially complete, although decoration doubtless was an ongoing process. Note the word structures in the preceding sentence. There are really three distinct buildings in the Pantheon. The "pronoas or entrance porch, which looks like the front of a standard Greco-Roman temple; the circular domed rotunda: and an intermediate building connecting the porch and rotunda. 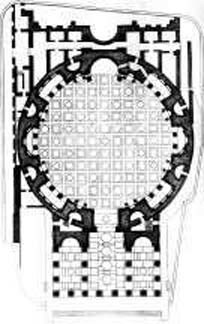 Pantheon floor level plan: The pronoas (three rows of round pillars and a row of square pillars) is at the bottom of this plan (north). 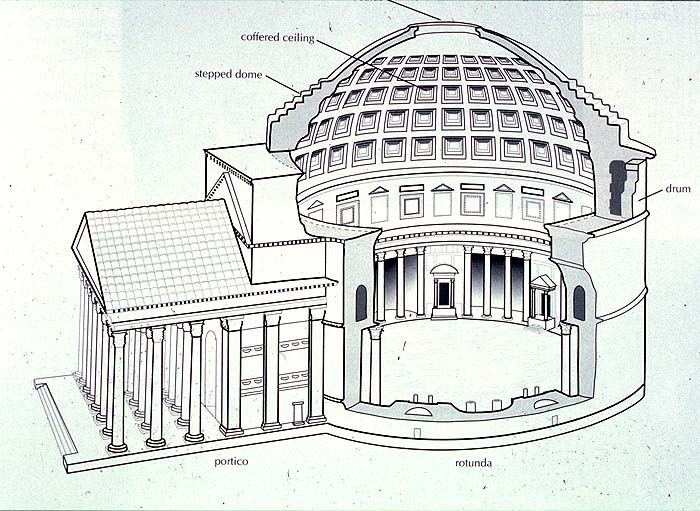 The interior niches (alternating semicircular and slightly bent rectangular) and chambers with external access of the rotunda are easily seen. Between the pronoas and rotunda is the intermediate connecting structure, shown on the plan as two semicircular niches right above the square pillars at the back of the porch (but there is a superstructure above the niches and the passageway to the doors of the rotunda). The chambers at the top of the plan were originally associated with Agrippa's baths, which were to the south (top in this plan). Their function, if any, at the time of Hadrian's Pantheon is unknown. The curvilinear double line around the Pantheon is the modern retaining wall around the excavations. The Pronoas had sixteen monolithic round pillars of Egyptian granite. Originally eight were gray-green and eight were pink, but three have subsequently been replaced, two of which with red granite pillars from the Alexandrine Baths near San Luigi dei Francesi near Piazza Navona. Four more square pillars are at the rear, but they are sometimes counted as part of the intermediate structure. The intermediate building is higher than the porch and had its own peaked roof, upper-floor side rooms and upper level porches. The pronoas and the intermediate building and other surrounding structures apparently were designed to block the view of the rotunda from the outside. The porticoed square in front of the porch was also constricted to prevent viewing of the dome from outside. The whole complex appears to have been assembled with the idea of inspiring awe in the first time visitor, who would walk into a perfectly normal looking temple and, instead of a "noas" chamber for the image of the god, find himself in that vast and sumptuously embellished domed rotunda! The effect still works even for those who have visited the Pantheon often and know its shape and size. Hadrian, known as the philosopher emperor (before Marcus Aurelius was) because he committed his intentions and emotions to writing, said this: "My intentions had been that this sanctuary of All Gods should reproduce the likeness of the terrestrial globe and of the stellar sphere...The cupola...revealed the sky through a great hole at the center, showing alternately dark and blue. This temple, both open and mysteriously enclosed, was conceived as a solar quadrant. The hours would make their round on that coffered ceiling so carefully polished by Greek artisans; the disk of daylight would rest suspended there like a shield of gold; rain would form its clear pool on the pavement below, prayers would rise like smoke toward that void where we place the gods." The dimensions are shockingly grand. The rotunda is 142 feet (43.3 meters) in diameter and above it is a perfectly hemispheric dome of exactly the same diameter and the same center height: Hadrian's 142 foot "likeness of the terrestrial globe and of the stellar sphere" was a perfect fit. The oculus or eye, the circular opening at the top of the dome had a diameter of 27 feet (8.2 m). A row of windows on the drum of the rotunda provided additional light, and there were openings to allow light from above into the interior niches. The foundation below the circular wall of the rotunda is 26 feet (8 m) wide and 15 feet ( 4.5 m) deep and is made of pozzolana cement (lime, volcanic pozzolana sand first found near Pozzuoli near Naples, and water tamped down over layer of dense stone aggregate -- the predecessor of modern "portland" cement, the name of which is probably itself a corruption of "pozzolana".) 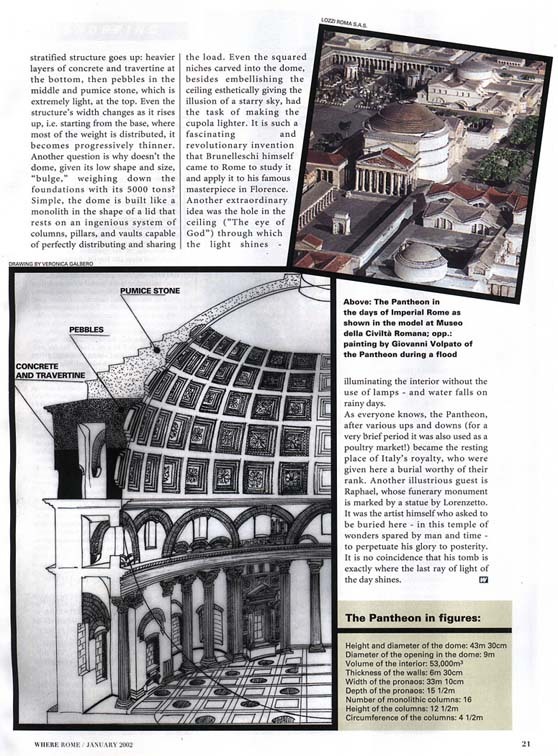 The thick circular wall of the rotunda, also of pozzolana cement and cloaked with a layer of brick, rose exactly 71 feet from the foundations -- half the diameter of the sphere -- before breaking inward to form the coffered dome. Like the rest of the structure, the dome is of pozzolana cement. The interior shape is, as noted above, hemispherical and coffered to reduce weight. The outer surface steps inward, gradually reducing the thickness of the dome wall. 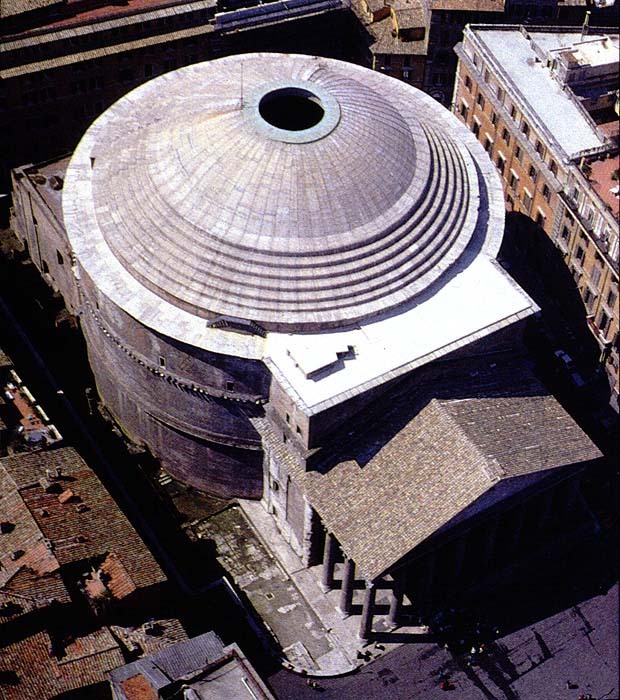 The aggregate material mixed with the cement in the lowest part of the dome is dense volcanic stone, and less dense materials are incorporated as the dome rises to the oculus, again to reduce weight: at the top the aggregate is light pumice and some small empty clay jars are also mixed in. Modern coring indicates that the entire dome was essentially one continuous "pour" of cement. There had to have been continuous mixing of batches of cement to be poured over the gradually lightening layers of aggregate, and the planning and execution of such a great project would have to have been extremely meticulous. There are no known pouring discontinuities in the cement structure from the top of the foundations up to the oculus. The cracks in the drum radiate upward into the dome in no particular pattern, and this means that the dome is less stable than the drum. The monitoring engineers say there's nothing to worry about. Only the merest traces of the decoration of the triangular faces above the porch and on the connecting building remain: there are holes, into which pins for mounting (presumably) bronze figures would be inserted, and there are a few projecting rectangular stones of unknown purpose in each of the lower corners on the upper face. Mounting-pin-hole specialists (everybody specializes in something!) suppose that some kind of wreath or other round ornament was in the center of the lower triangle. 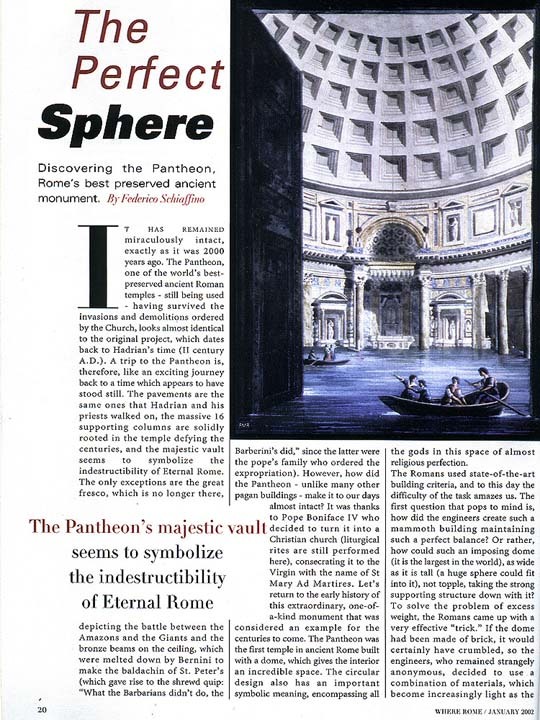 The marbles, statues, decorations, altars and tombs now inside the Pantheon are definitely not original equipment. Most were added during the renaissance, but there are some 19th and 20th century tombs. Among those entombed in the building are Raphael and his girlfriend -- he was forced to marry someone else by his patron Cardinal. King Victor Emmanuel 2 is in the ornate box on the right hand side (died 1878) and a lamp above it burns in honor of Victor Emmanuel 3 (died 1947). Directly across the wide rotunda is the tomb of King Umberto 1, who was assassinated in Rome in 1900 and his extremely popular wife, Margherita di Savoia. The above is just a tiny scratch on the surface of what is known about the pantheon. Two good printed sources are "The four books of Architecture" by Andrea Paladio, written in 1570 (available in English translation on line and at better Roman bookstores), and "A New Topographical Dictionary of Ancient Rome" by Lawrence Richardson, Jr., available from the same online sources and bookstores. There are also, of course, scholarly and popular volumes and multi-volume works dedicated to the building, some of the best, naturally, only in Italian. P.S. : It is often said that the Pantheon is the only temple structure in continuous use since ancient Roman times. That's not true. It was closed as a temple in the fifth Century and not reopened again until 608/9 when Emperor Phocas ceded it to Pope Boniface 4 so that it could be turned into a church. It is, therefore, definitely not a Constantinian structure, as some guides/guidebooks would have you believe. The church again fell into disuse during the period when the papacy was resident in Avignon (1309-77) and was rededicated at the end of that period.